Splatoon 2’s SplatFests are always a great excuse to return to the online shooter if you’ve fallen off over the month past. The entirety of Inkopolis is turned into a massive party, as you choose you allegiance to either Marina or Pearl and settle a wager. Unlike the incredibly heated debate between Mayo and Ketchup last month (and the horror show of the fights), this month’s debate between which superpower was best was a little less intense. Even if my team ended up losing again. 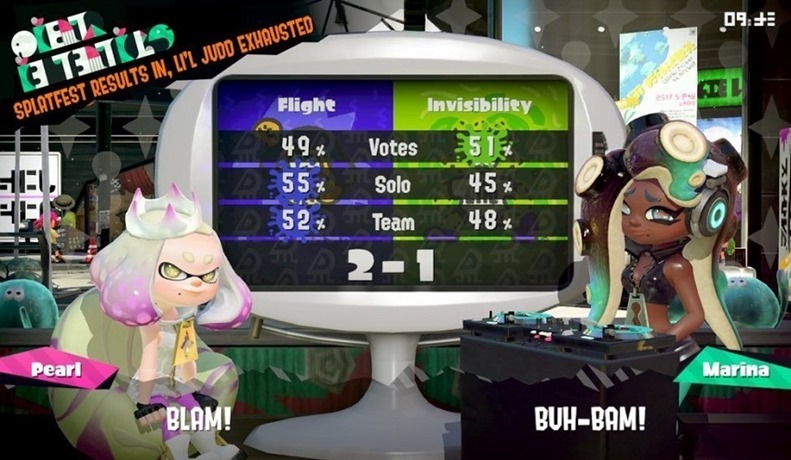 Flight or Invisibility were on the cards this weekend, with Pearl siding with those who’d choose to soar above everyone else in the air and Marina choosing those who would rather “spy on people while they were… inking their Splat Zone”. Naturally, Marina had the more hilarious argument, and so Invisibility it was. And just going by one of the metrics that decided the overall winners, I wasn’t alone. Invisibility won the popular vote, but faltered when it came down to actual battles between the two sides. 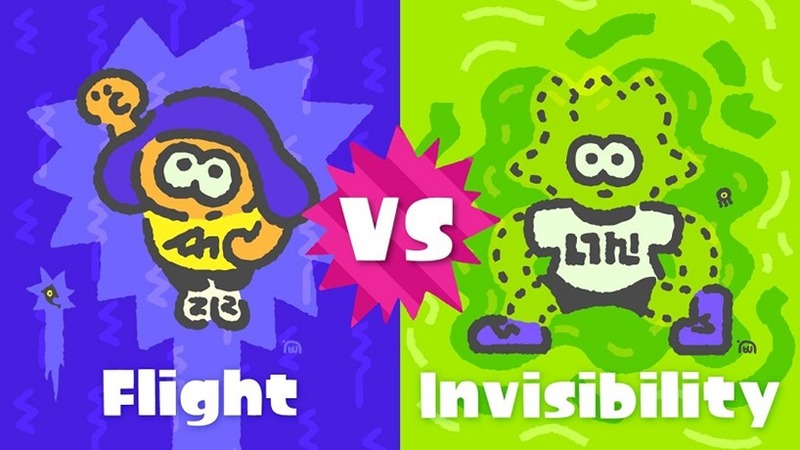 It’s important to again mention how weird these SplatFest results are calculated. A point is awarded for one of three metrics – the popularity of a given choice, the performance in solo fights and the performance in team fights. The problem with the popular vote here is just the chance of getting paired up with actual opponents rather than more people on your side of the SplatFest – which doesn’t contribute to the only other two brackets that need your playtime. It’s the reason Ketchup has 75% of the player vote but still lost, which just highlighted how bad this maths really is. Regardless, it’s still incredibly fun, and a neat way to encourage players to return to the game. All your SplatFest exclusive gear will be returned automatically the next time you enter the game, and your contribution to the festival will be rewarded with snails (Splatoon is so weird). Japan is kicking off their McDonalds Fries vs. Nuggets SplatFest this weekend, but we’ll see have to wait for the next western one in the coming weeks.